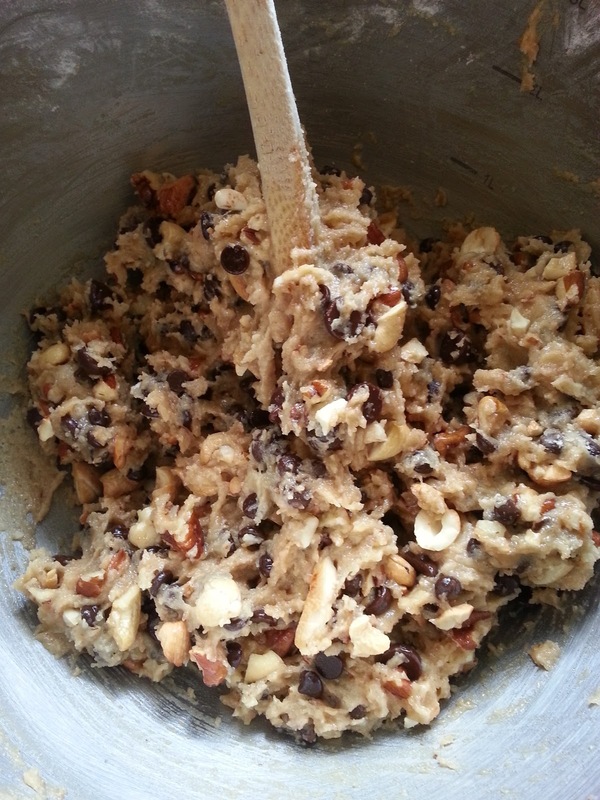 I can still remember the first time time I made my own batch of chocolate chip cookies on my own. I was just a wee sprat in my twenties, and had no idea what I was doing. All I knew was that I wanted that familiar taste from home, so I did what any good son would do and called my mum on the phone. 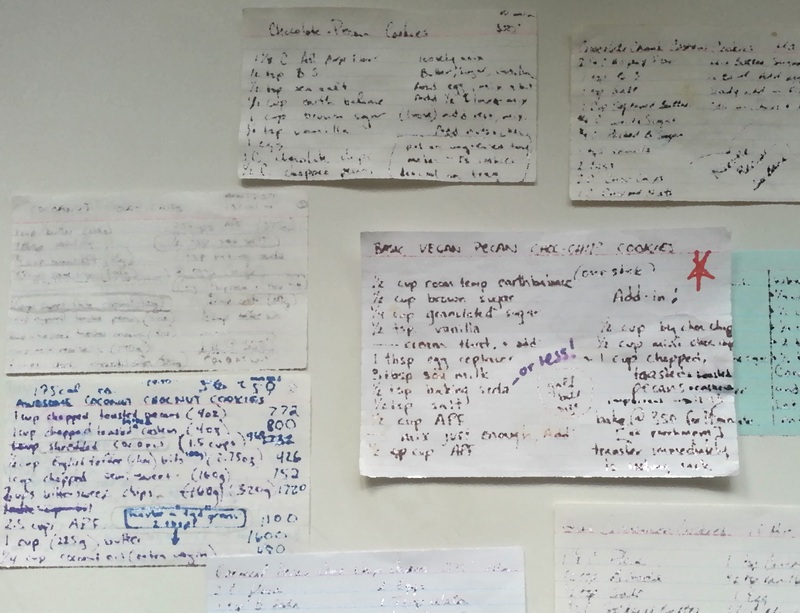 I diligently wrote down her tried and true recipe and every bit of advice she had to give. At the time, I wasn't aware at all of the difference between an awful cookie and a good cookie. Being young has its advantages. I just wanted that familiar pillowy, slightly crunchy, chocolaty goodness, and to be able to eat as many as I wanted, whenever I wanted! Many years and many batches of that same basic recipe later, it dawned on me that you didn't actually have to follow the recipe. You could actually play with the ingredients. Change something here, tweak something there, and that was the start of a year long obsession I had with chocolate chip cookies. I bought books, looked up recipes, spent many nights adjusting and testing each part of the recipe until I got something I actually started to love, not just something satisfying. It was a precisely tuned recipe.. a subtle dance between the ingredients we can get locally, our kitchen stove's temperamental settings, and the delicate relationship between each of the ingredients. It was perfect! But it had one problem ... it was based on butter. 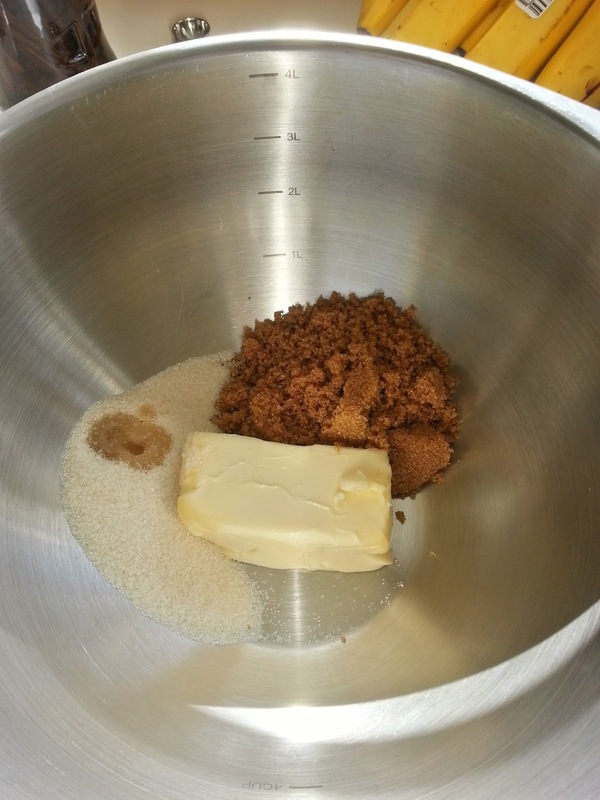 That's how many cookie recipes start -- cream butter and sugar together and go from there. When our family started transitioning to a vegan diet, it was like starting over. Replacing the butter with earth balance sort of worked, but not really. It was oily, it tasted like rancid soy, and all-in-all, it was very disappointing. 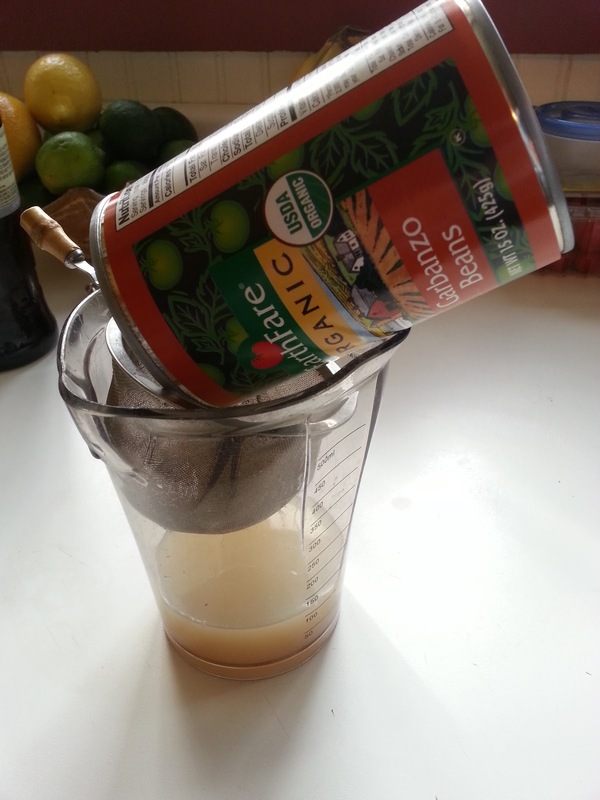 When we found soy free earth balance, I tried that. 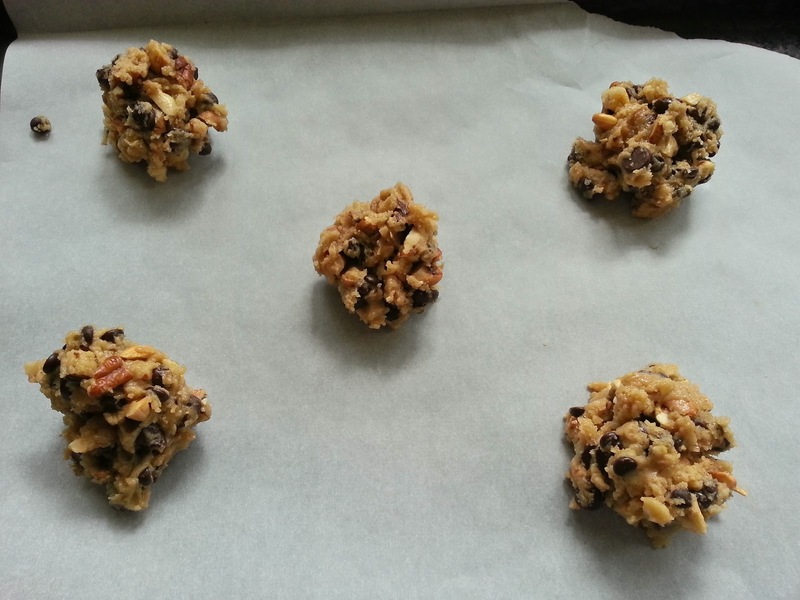 It got rid of the horrible soy taste, but to make the cookies work, I had to use flax or commercial starchy egg replacers, and that made everything taste weird. That perfect balance was lost, and I didn't have the energy to make it all work, so I stopped making chocolate chips cookies. 1/2 cup room temperature earth balance, preferably soy-free. 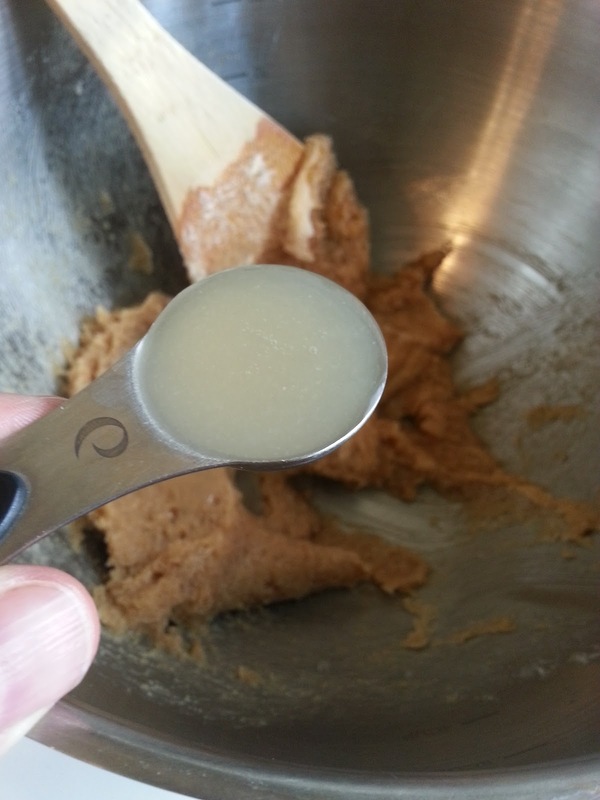 Before you start, you need to make sure your vegan butter is at room temperature. You can't melt it in a microwave, no matter how slowly you try. You really need to let it sit out, or you're facing an up-hill battle right out the gate. Take a stick out before you go to bed, so it's soft in the morning. 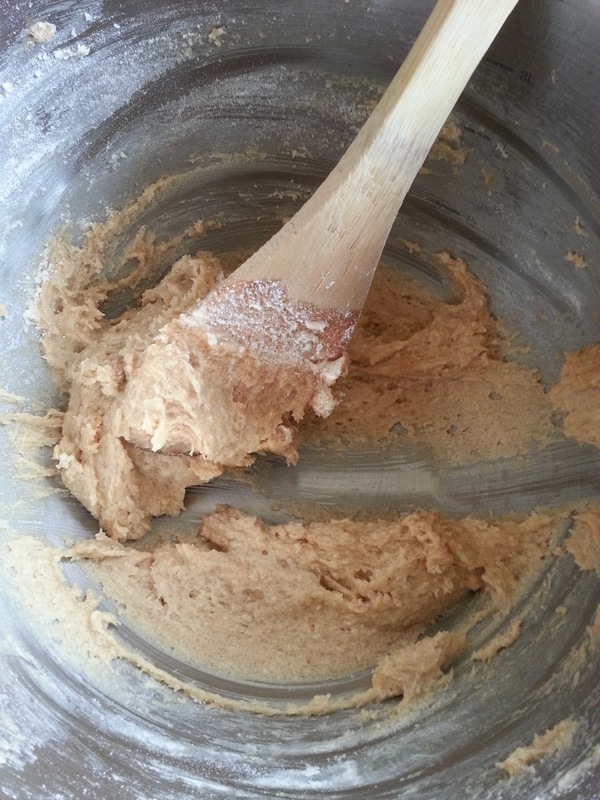 I like to use a large bowl, even for a small batch like this recipe, because I like to mix my batter by hand, and it gives me something to hold on to. Mixing by hand saturates the recipe with a loving energy. There's something about a mixer that skips all that and makes the batter run together in a way that changes the whole texture of it. The same thing happens if you try to melt your butter first. Drain the liquid from a can of chickpeas (garbanzo beans) through a fine mesh. If you don't have a fine tea strainer or mesh, don't worry, it's not that important. If you don't have chickpeas, you can probably get away with the liquid from any of the white beans ... great northern, cannelinni (can o' linie), etc. 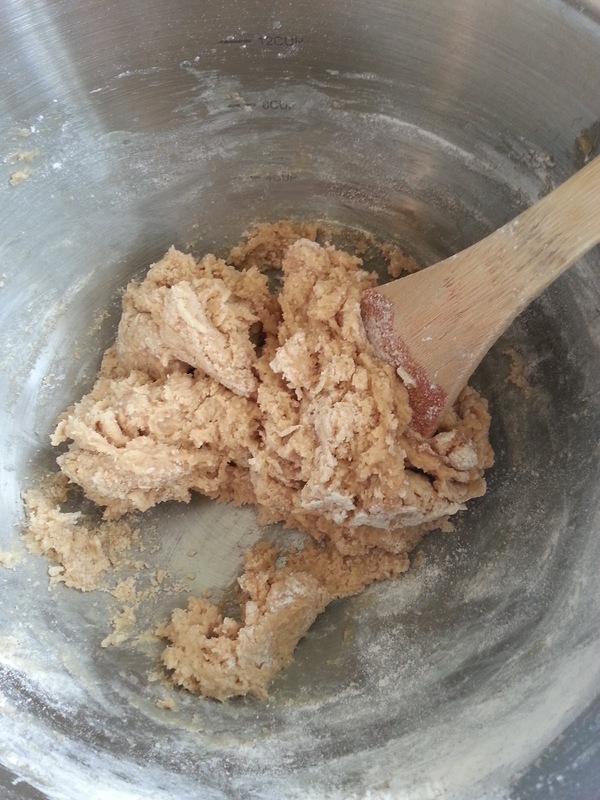 After you drain your liquid, take three tablespoons of it and add it to your batter. 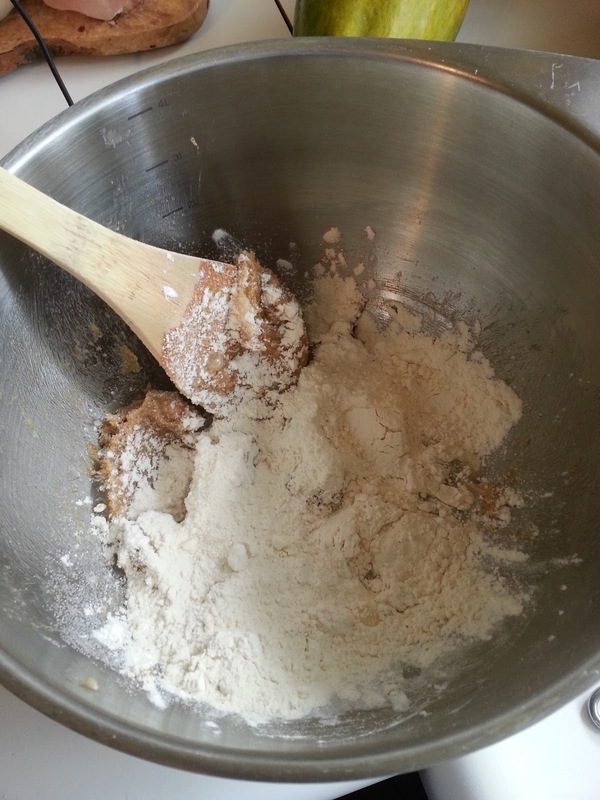 Step 3 - Add the flour, salt, and baking soda. And mixed until just incorporated. Don't over mix, don't worry about the sides. Less is better here. 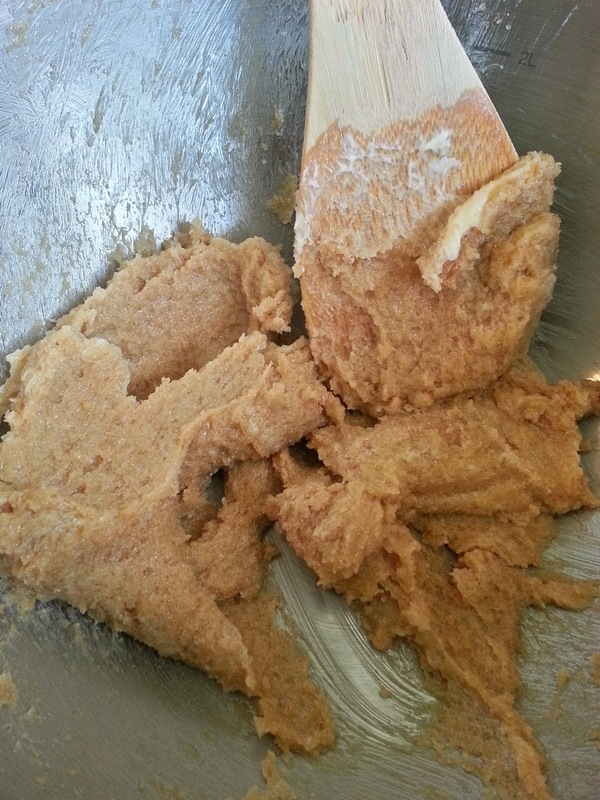 At this point the batter is relatively dry, has a lot of folded layers in it and is not overly mixed. Set it aside and gather your fixin's. Step 4 - throw in the goodies. After everything is tossed in, just mix it all up. You want to mix it until it appears mostly uniform. 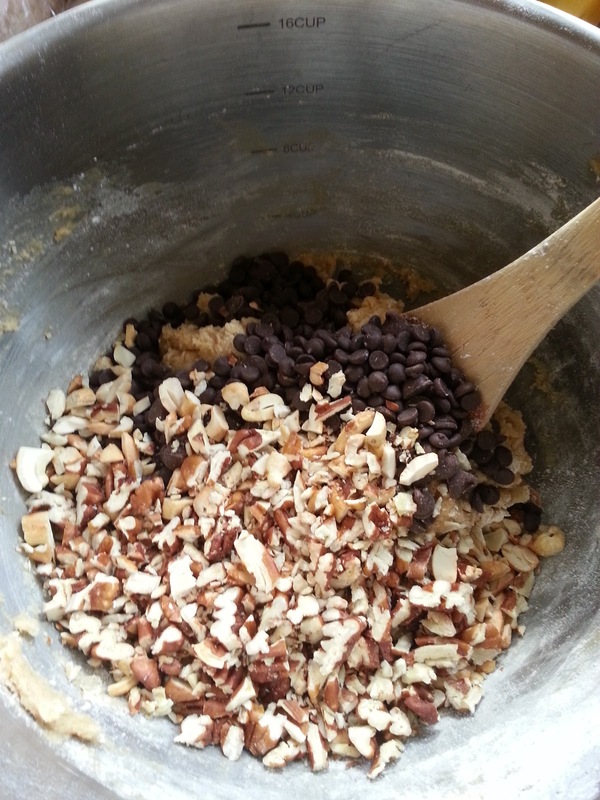 Don't over mix it, but you want the nuts and chocolate chips pretty evenly distributed. At this point you may need to restrain yourself, because the batter is so amazingly good. I never can. Do not roll your dough, do not press it, do not mush it around. You want it to drop it onto your baking mat or parchment paper and let it remain free and unencumbered. It just tastes better that way. 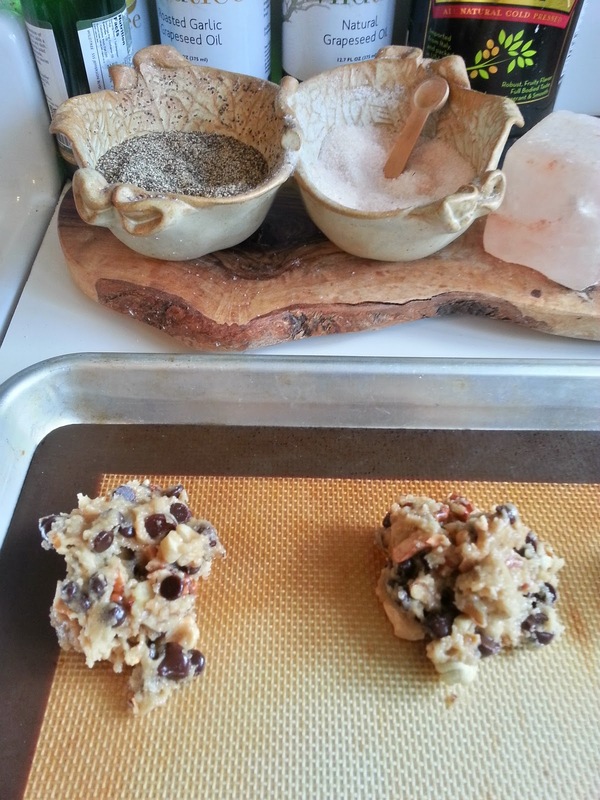 You can use parchment paper or a baking mat. It doesn't really matter. 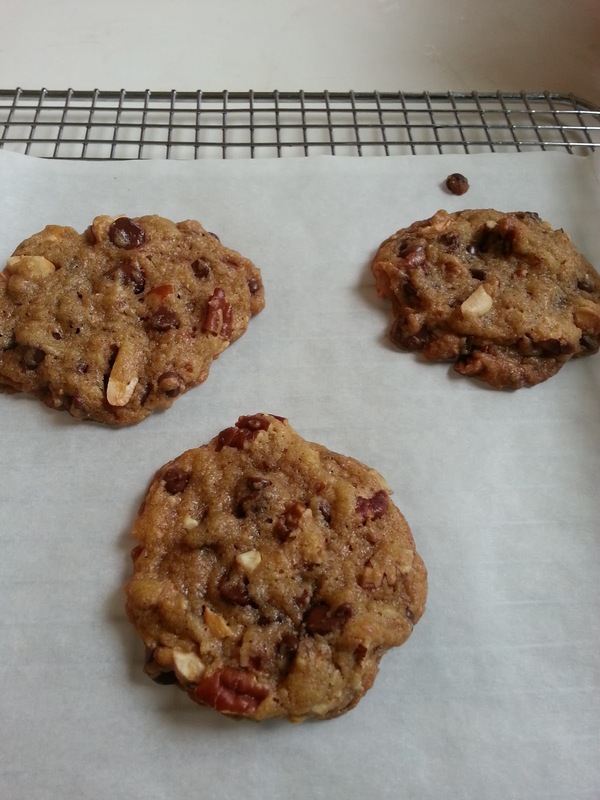 the bottoms might brown a bit more on parchment paper, but you can avoid that by taking them off the cookie sheet as soon as they come off the oven. 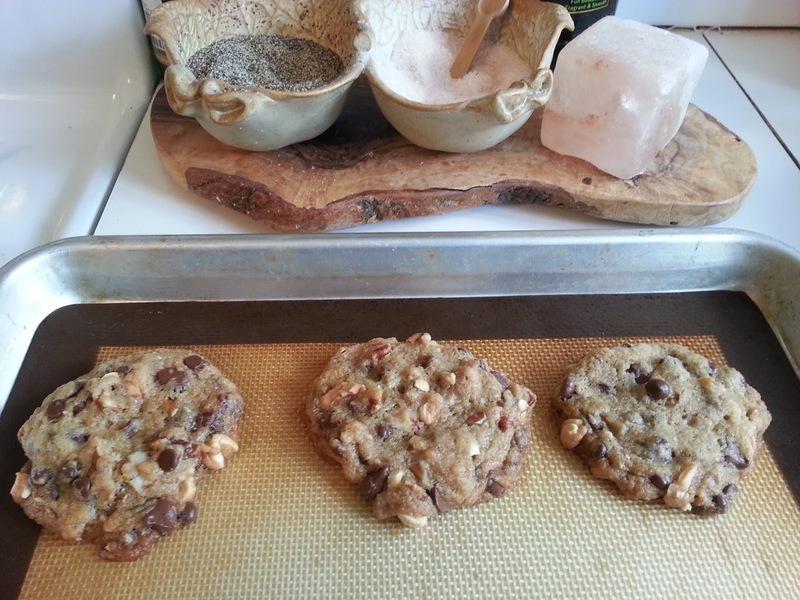 Just slide the whole parchment paper off to the side onto a cooling rack and leave them alone to do their thing. My cookie sheets have ridges on the side, so when I slide them off, the whole cookie is soft and supple and slides up and over and back down that ridge like a piece of cloth would, but it doesn't matter, because it's as they cool that they crisp up and get their final texture. They're pretty malleable before that. Notice how these look all oily and unattractive right out of the oven? And when they've crisped up enough to pick up without breaking, they end up dry and picture perfect, and simply divine. Using aquafaba as an egg replacer is nothing short of miraculous. 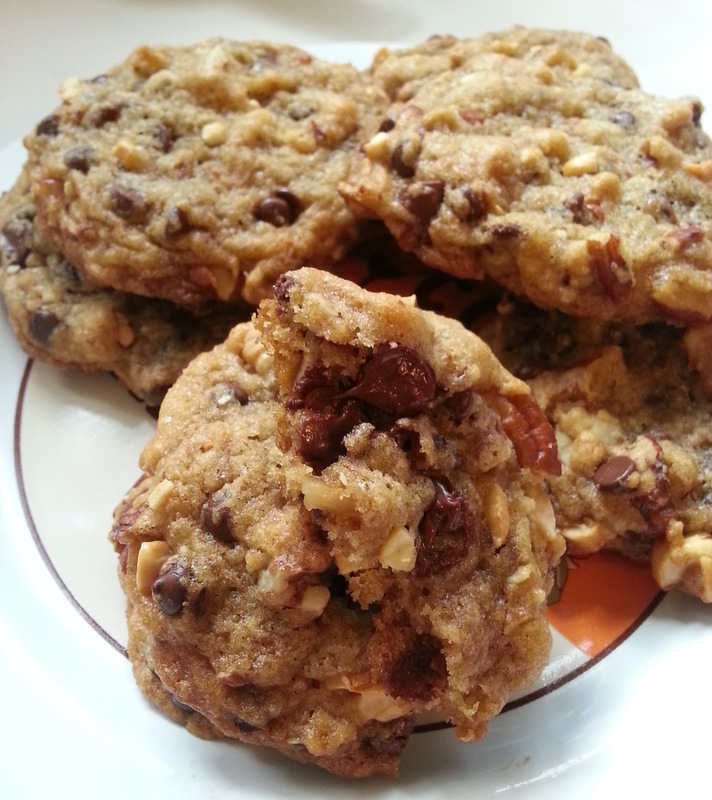 I just cannot stop eating these cookies, and now I have no excuse not to make them all the time. Mwhoooahahahha! Also, if you want to save the batter, it does really well in the fridge over night. You can even freeze balls of the batter and take them out as you need to cook them. When you do this, just put them directly in the preheated oven or toaster oven straight from the freezer. They may need an extra minute or so, but as long as you cook them until they do not appear wet on top any more, they're just as good as fresh. Here is another photo snapped with my phone. There are no filters, no editing, no re-touching what-so-ever. I just dumped the ones from the previous pictures onto a plate and snapped one in half. 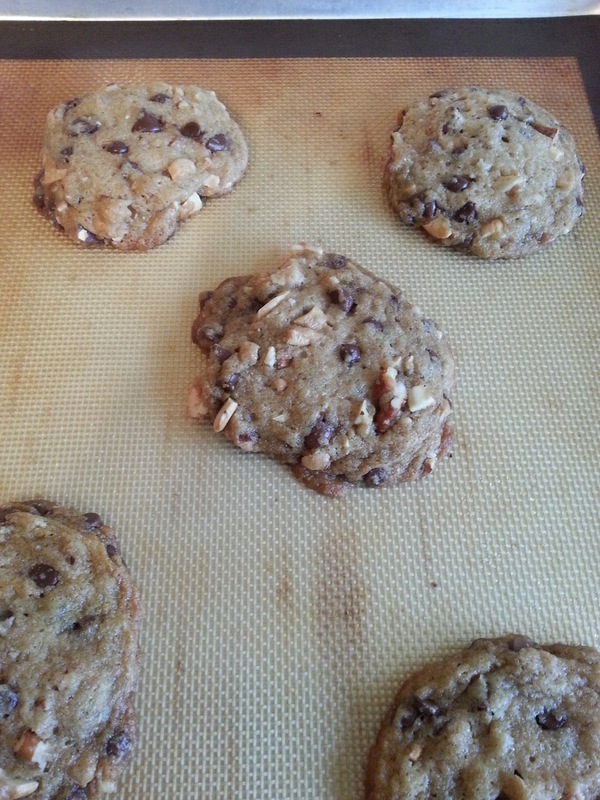 Notice how the tops are no longer oily and they settle slightly into that perfect chocolate cookie shape? 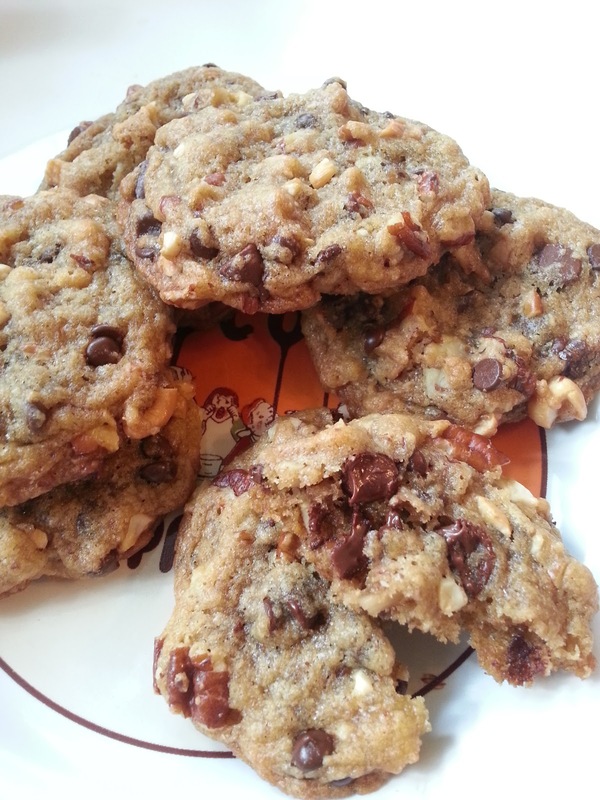 You simply can't ask for a better balance of ingredients in a cookie. Delicious and perfect dessert recipe for us who can make this at any parties. 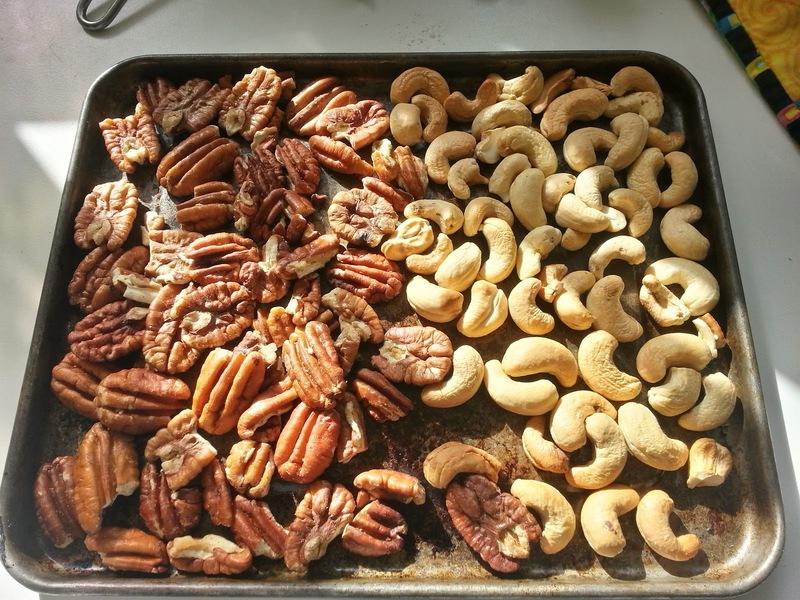 They look so yummy, but what if I don't want to add nuts on it? do they still taste that good?